Please watch 「Light Field Imaging」movie click here. 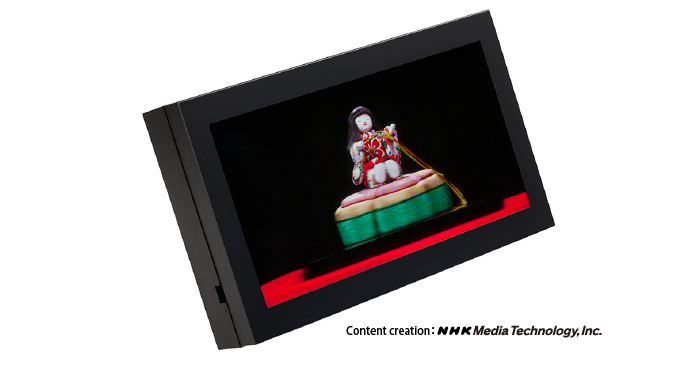 May 19, 2017 (Tokyo, Japan) - Japan Display Inc. (JDI) and NHK Media Technology, Inc. (NHK-MT) today announced their collaborative research and development to introduce a next-generation 17.0-inch Light Field* Display. Through this collaborative research, they developed the 17.0-inch Light Field Display based on an 8K LCD created with JDI's proprietary high-definition technology, combining it with NHK Media Technology's unprecedented high-definition, next-generation 3D image processing, resulting in a display that is able to express extremely realistic images. The newly-developed display features an ultra-wide viewing angle, wider than conventional light field displays. Without any special glasses, it is possible to view an image from any position, as in the real world. JDI and NHK-MT intend to continue their collaborative work in new technological research and development, striving to offer new display imaging experiences. The 17.0-inch Light Field Display will be demonstrated in JDI's booth #917 at The Society of Information Display (SID) "Display Week", at the Los Angeles Convention Center, May 23 - May 25, 2017, in Los Angeles, California, USA. SID's Display Week is the premier international event for the electronic display industry, where breakthrough technologies are introduce. Display Week offers synergies unparalleled by any other display event, comprised of attendees and exhibitors representing the foremost display-engineering talent from all over the world, as well as leaders representing both the commercial and consumer markets. *What is a "Light Field"
In the real world, light travels in an infinite variety of directions, and we recognize our three-dimensional world by the way in which we see this light. "Light Field" simulates this infinite light concept and enables stereoscopic vision by reproducing light emitted in many different directions. NHK Media Technology, Inc. is one of the major subsidiaries of NHK, Japan's sole public broadcaster.NHK Media Technology, Inc. is responsible for the technical operations of NHK programs and the development and operation of its computer systems. We thus support NHK's broadcasting by our state-of-the-art broadcast engineering and reliable information system technologies. As the media environment undergoes remarkable change and broadcasting services diversify, we are making full use of our twin-pillar technologies to challenge the very limits of these potentials in the industry. Our goals is to seek the better combination of broadcasting and telecommunications, and higher quality though 8K UHDTV production for the future.